Summary: Vegan Meringue?? Yes! If you haven't heard about aquafaba (sometimes spelled 'aquafava', although it is 'aquafaba'), you are in for a delightfully shocking surprise! Aquafaba is a perfect egg white substitute that whips up exactly like egg whites, and behaves like egg whites in all sorts of recipes. And, aquafaba is not only readily available at any grocery store, but we bet you have poured it down the drain on at least one occassion. Vegan meringue?? Yes! If you haven’t heard about aquafaba (sometimes spelled ‘aquafava’) you are in for a delightfully shocking surprise! Aquafaba is a perfect egg white substitute that whips up exactly like egg whites, and behaves like egg whites in all sorts of recipes. And, aquafaba is not only readily available at any grocery store, but we bet you have poured it down the drain on at least one occasion. That is because aquafaba is nothing more than the liquid from a can of beans! Yes, that is what we are saying! If you drain the liquid from a can of beans (usually chickpeas, but other beans work as well) into a bowl and whip it with a mixer, it responds just like egg whites! And the taste, at least for the liquid from a can of chickpeas, is so mild that you don’t even taste it when you use it in recipes (such as the below recipe for vegan meringue)! This makes an incredible, fully vegan meringue, requiring only two ingredients! Aquafaba and sugar. Here is our vegan meringue recipe using aquafaba. Preheat your oven to 200 (pie) or 215 (cookies) degrees Farenheit. Drain the liquid (this is your aquafaba) from the chickpeas (reserve the chickpeas for some other use) into a measuring cup. You will likely end up with about one-half to three-quarters of a cup of liquid, but it doesn’t matter how much you get, so long as you measure it. Put the liquid in your mixing bowl (we use a Kitchenaid), and add an equal amount of sugar. So for a half cup of liquid, add a half cup of sugar. Beat it on high until it forms stiff peaks. Then beat it some more. When you are sure you are done, beat it some more. You will be amazed at how incredibly stiff peak this stuff will get! Note I: Some recipes say to beat the aquafaba to stiff peak first, then slowly incorporate the sugar – we didn’t do that, we put both in all at once, and it worked just fine. Your mileage may vary. Note II: It’s best to put your sugar in a food processor and grind the heck out of it, so that you end up with a superfine sugar. This will make a smoother meringue. But you don’t have to. For Meringue Pie (read recipe for meringue cookies below): Spread the meringue over your already cooked pie, and bake for 2 hours (approximately) at 200 degrees F. If, when it’s done, your meringue is too pale for your liking, and you want to brown it up a bit, put it under the broiler for just a moment or two (watch it closely, it browns quickly). 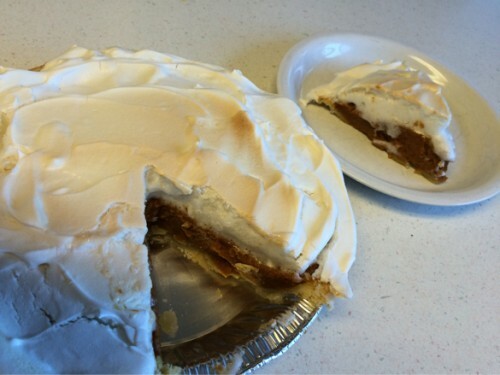 Vegan Pumpkin Meringue Pie – It Was Delicious! Meringue Cookies: Drop the meringue by spoonfuls onto cookie sheets that have been lined with either parchment or brown paper (from a brown paper grocery bag). You can also pipe the meringue with a pastry bag if you want them to look extra-fancy. Bake for 1 1/2 to 2 hours – you will need to experiment with this the first time to see what works for you, your location and your climate. We are a mile high, and had to bake them for two hours. NOTE: THEY WILL REMAIN SOFT AND TACKY TO THE TOUCH UNTIL YOU TAKE THEM OUT! So the best way to tell if they are done is to remove one, and let it cool. If it cools to the consistency you want, take the rest out. 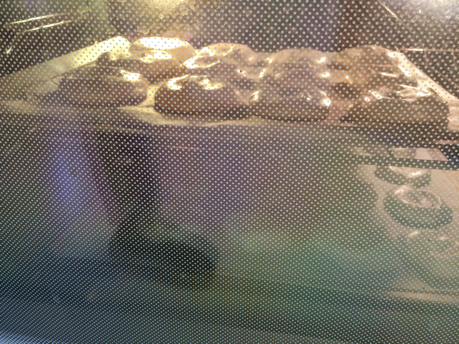 Once done, turn off the oven, and leave the meringues in the oven with the door cracked until completely cool. We were going for fully crisp, so we not only left them in for two hours, but then turned the oven up to 300 – and when we did that, in just a matter of a couple of minutes they turned a slightly darker colour, and then we deeemd them done, and they came out perfectly. Let us know in your comments how yours turn out! Vegan meringue? Yes! 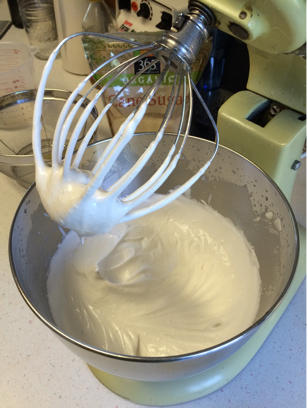 If you haven't heard of aquafaba, you are in for a delightfully shocking surprise! And it's extremely easy to use to make vegan meringue!